Page 350: At CLXIV Canal Boat St.
For a briefer but poignant portrait of this neighborhood, see Christoper Morley's essay elsewhere on PhillyH20. Every city holds out-of-the-way places unknown to the mere sojourner within its gates, and full of local oddities and delights which the stranger, however experienced, can never share with the citizen. To the casual visitor in Philadelphia the cabalistic word "The Neck," and the piquant phrase "Down in the Ma'sh," convey no meaning. To the native Philadelphian who can recall days when the lore of "Watson's Annals" was oral tradition, not vulgar written words, the Neck contains unspeakable associations. 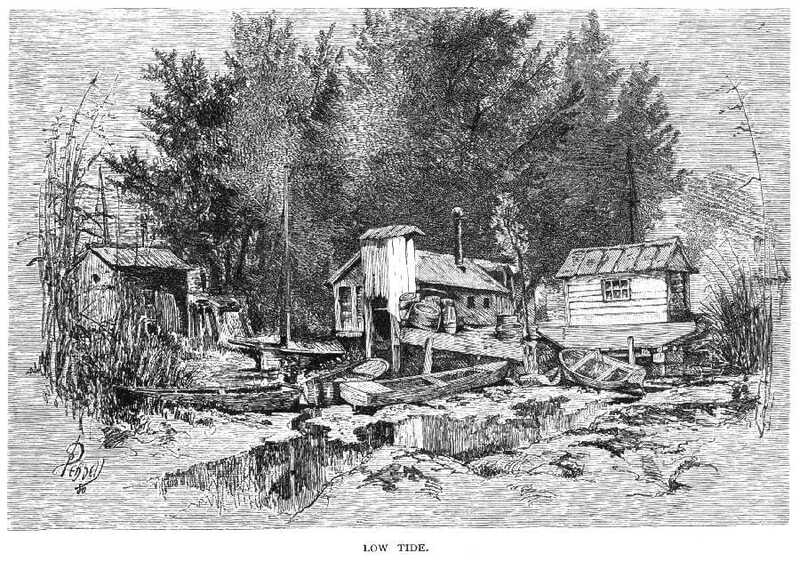 "The Old Point House," a half-forgotten structure on the Delaware, figures in many stories still told by the small boy as he fishes from the dilapidated wharf near its site. The Philadelphia urchin has a strange affection for his uncle, by the way: if you threaten him, it is always his uncle who is a policeman and will avenge him, his uncle who owns the tightest gunning-skiff in the Ma'sh, his uncle who shot a fabulous number of reed-birds last year. He will tell you how his uncle stopped overnight at this inn, the Old Point House, and, being attacked by some vile Jerseymen or Hessians, frightened them off with an account-book which they took for a horse-pistol; how his uncle saw the headless horseman who used to ride down into the Ma'sh from the old coach-factory, which, tradition has it,--no doubt untruthfully,--was the house in which part of the festivities attending the famous Meschianza were held. The Old Point House was in the Neck, Eleven-Gun Battery is in the Neck, the Ma'sh is part of the Neck, and Martinsville, or Frogtown, is in the Neck. Fashionable Philadelphians do not affect the Neck as a promenade. It is unknown to the "new people" that dwell in West Philadelphia, and to the rising generation of those quarters in which the aristocratic bicycle and other usurping innovations are common; but to the boy who lives in the part of the city once known as Southwark, it is a well-spring of joy and dirt. It is celebrated for its cabbages, its pigs, its dogs, its dikes, its reed-birds, its inhabitants, and, above all, for its smells. Under the last head it is related that an exiled inhabitant of [PAGE 344] Cologne, dying of homesickness,--who had been carried to Hunter's Point, opposite New York City, in the vain hope that there some reviving reminiscence of his beloved town might strike his nostrils,--was immediately restored as the odors from the Neck greeted his bereft olfactories. He recognized his cherished perfumes, accompanied by several new ones. Time and a ruthless municipal government have taken from the Neck much of its romance. In the days of the old fire department, the youthful Philadelphian who could "bag it,"--i.e., play truant on a school-day, or break away from his mother's apron-string on the blissful Saturday, might have had all the emotions of a dime-novel hero crowded into the space of an afternoon. 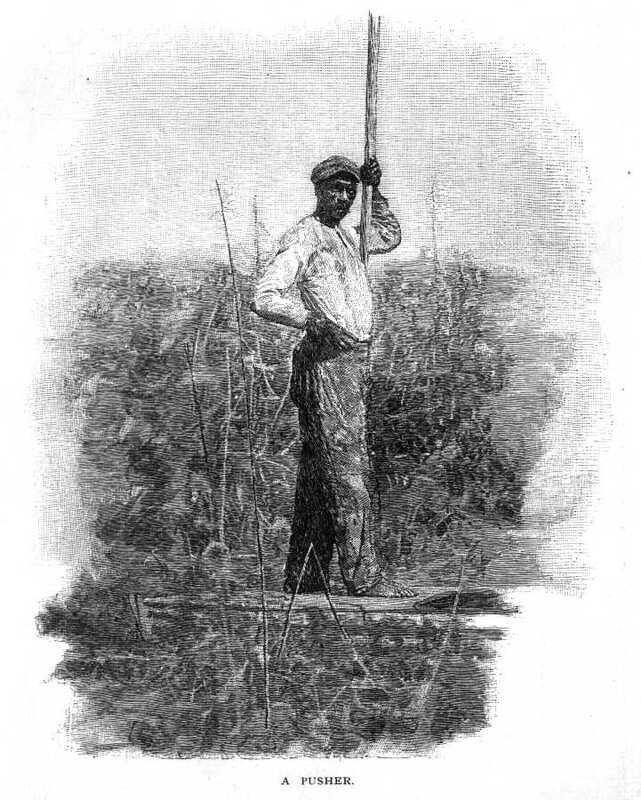 Having concealed his penknife, his slate-pencils, his jackstones and marbles in his boots, his "soaker" (a round disk of leather attached to a string, which the Philadelphia boy soaked and used for pulling up bricks from the sidewalks) up his sleeve, his sling-shot and a choice collection of pebbles in his hat, and miscellaneous articles in his mouth, he started forth stealthily to kill frogs, to hunt rats in the banks, or to meet his foes. If he was a member of the Shuffler Hose Company, the members of that company who met him would amiably refrain from "tackling" him, and his penknife and other impedimenta might remain in his possession; but woe to him were he to meet a Weccacoe, a Hibernia, or a Fairmount boy! and woe! woe! if a "Schuylkill Ranger" or a "Killer" were to take him in hand! But we have changed all that. Romance has fled; adventure is no more. The boy may wade up to his middle in stagnant ponds on which the iridescent coal-oil floats; he may hunt for frogs, bottle tadpoles, long for the solitary mud-hen, dive from Reed-street wharf when the policeman is away, and cling to the chains of vessels; he may load himself with the marsh-marigold or the malarious buttercup, in the futile hope of propitiating an anxious mother, to whom the Neck is a word of fear; he may receive the sprinkling shot of the city sportsman, he may pick up a stray reed-bird, he may even catch an eel--but he can hardly realize the excitement of those perilous days. The war-cry of "Yea! yea! yea!" no longer resounds over the flats. The excitement of the stone-fight is only a memory. The stones wielded by the Moyamensing boys or the Shuffler champions lie beneath new soil. And the enervated Philadelphia boy, [PAGE 345] who knows not the "soaker," fears the fray, and never thinks of breaking a window or "tackling" an enemy for fun,--knows nothing of the ruder days that went before. The Neck stretches below the city proper. Broad street, passing the palaces of private citizens toward the north, skirts the Union League Club House farther down, flows into the form of a drive,--called by the ambitious a "boulevard,"--bordered by delicate and nondescript trees, sweeps proudly against the farms of the truckmen, and finally loses itself in League Island, the site of the Navy Yard. On either side of it, the moment it reaches the truck-farms, stretches the Neck. To the east, along the Delaware, is the Ma'sh. The land is low, and high dikes, or banks, prevent the aggressions of the Delaware. These banks are fringed with wide spaces of bending reeds--tender in color in the spring (before their beards come) as young spring wheat, perhaps more brightly emerald, but growing yellower as the time draws near for that bird of which all true Philadelphians think and speak with reverence--the bobolink of the New England summer, the rice-bird of the later season in North Carolina, the reed-bird of the Ma'sh. 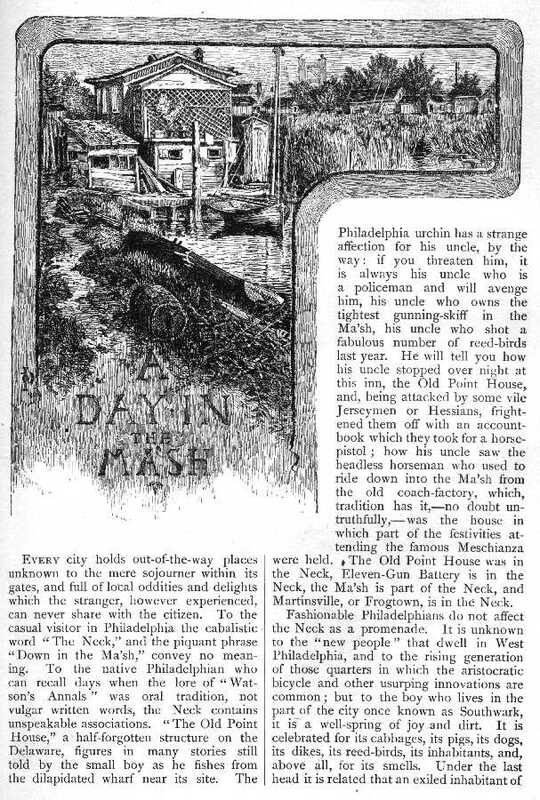 The sun which gilds the white shutters of red-bricked Philadelphia with a peculiarly dazzling luster, seen from the city itself, is a clean and respectable sun; but when one stands in the Neck, the mists that arise from the river and the Ma'sh give it a weird and uncanny look. The dikes, which seemed, in the faint gleams of dawn, like castled mounds, or deserted breastworks that had been used by giants, change from weirdness into the ugliness of reality; and the cart, which might three minutes before have been the chariot of the Magog of the city, loses the proportions morning mists give it, and your senses tell you that it conveys to the Neckers that substance gathered in the night which they would not give up for the most approved phosphates. The whole of the narrowing lowland at the southern end of the peninsula on which Philadelphia stands is called the Neck. The majestic Delaware makes a sudden sweep toward the more gentle Schuylkill, and suddenly carries her down to the sea. There is a fine distinction between the Necker and the Ma'sher. The Necker does not live in the Ma'sh--that is, along the brinks of dikes. He is generally a truckman, while the Ma'sher, living along the banks, often earns his living in other [PAGE 346] ways. Both the Necker and the Ma'sher are children of the soil. Though the Ma'sher may show by his appearance that he is either Irish or Dutch, the real Necker is, as a rule, of the Neck Necky. Thoughtless Philadelphians often confound pork-butchers, a large and respectable class of persons, with Neckers. This is a vulgar error. The Necker is long, lank, yellow, nasal-toned, if he be genuine; a pork-butcher may be anything. Pork-butchers do not inhabit the Neck. They are bourgeois; Neckers raise the pigs which they slaughter, and, though Neck blood may run in the veins of a pork-butcher, yet it requires much more than that to make him a Ma'sher; he is only a middleman. Though many foreigners inhabit the Neck,--principally Irish,--the real Necker is supposed to have Revolutionary blood in his veins; and the word Hessian is often used as a term of reproach,--to express the idea of rogue, as the Necker uses the word "Ledger" to express the general idea of newspaper. The Neck shows many signs of modern improvement since that mythical coachman or horseman first rode along its marshy shore, when General Howe danced and Major Andre painted. Oil-refineries are not unknown, and in many places whole plantations of the primeval Jamestown-weed have been destroyed by the loads of refuse from the soap-factories that have been cast upon them. But even the evidences of encroaching civilization assume a picturesque aspect in this mural yet rural territory. 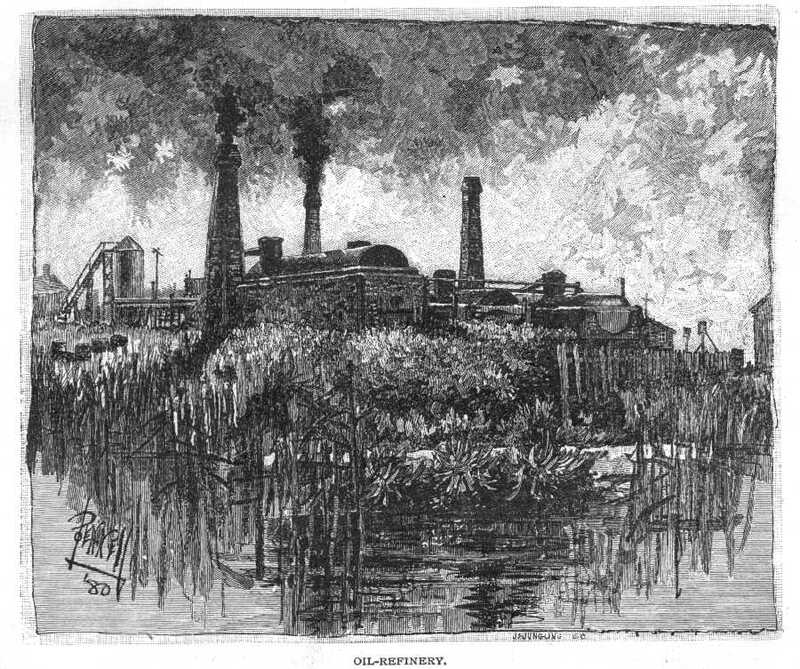 The spatter-dock may disdain to show its spiky leaves in the rainbow-hued pools that surround the oil-refineries, but the scrub-willow grows in clumps and the Jamestown-weed, crushed to earth, raises its ribbed white bugle among heaps of rubbish, though it cannot follow the blue flag into the half-dry ditches by the road-side. An occasional strawberry-leaf shows itself in the fields allotted to grazing, but, though hundreds of boys have engaged in the search, not a solitary strawberry is known to have been found. No wild rose blooms in this desolate expanse; on the greener of the banks purple and white scentless violets grow in the spring, and these the city children eagerly gather and transplant. In the early summer, huge square bare [PAGE 347] places show in the fields--the traces of those enterprising boys and men who load their wheelbarrows with sods, that Philadelphia back yards may he made green with the clover-mixed grass of the Neck. But the Neck is wide; the Ma'sh--let no purist call it the Marsh--is narrower, and more worthy of study. Green meadows stretch along the Delaware, with here and there the relief of cows and horses grazing on this land, which was Ma'sh in the spring rains and which will be Ma'sh again in the winter thaws. 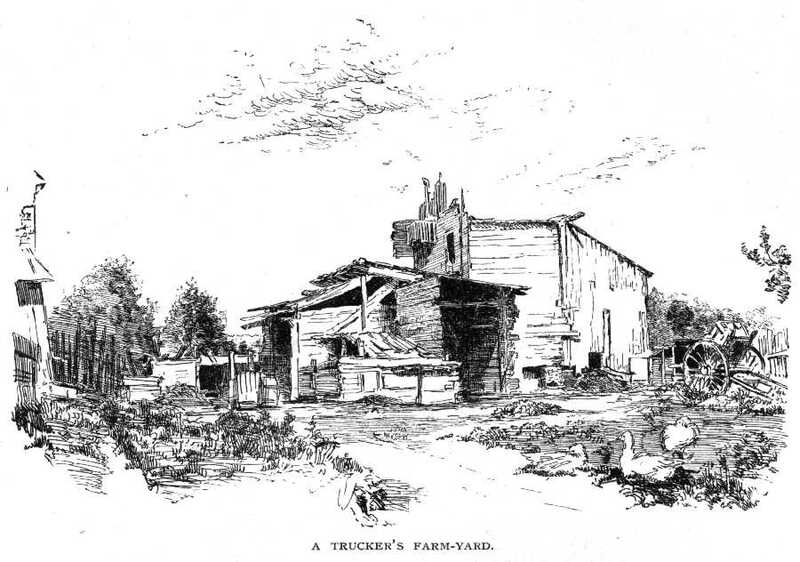 A trucker's shanty, white-washed, and with sashes filled with glass to force lettuce and the early radish, stands in the center of a rudely fenced patch of ground. Rows of vegetables, straight as the proverbial furrow can make them, cross the dark, moist soil. The pigs have a straw-thatched residence adjacent to the brilliant white house of their master. Their mistress, a burly woman ornamented with the inevitable calico sun-bonnet and wearing a huge apron of the same material of a purple tint, hints that it is going to rain. Her Dutch accents show that she is only a Necker by adoption. Stopping and pretending to give all your faculties to the consideration of the weather, you look into her house. The whitewash dazzles you. A scarlet geranium in bloom on the window-sill is like a trumpet-blast in all this silence of white; a neat rag-carpet covers the floor; the dresser contains a combination of dull-yellow crockery with the honored large-patterned blue-and-white. A chromo, with a tyrannical tea-store card pasted in one corner, delineating little Samuel awakening out of a pink robe de chambre, faces another in which two oyster-like infants are sweetly sleeping. 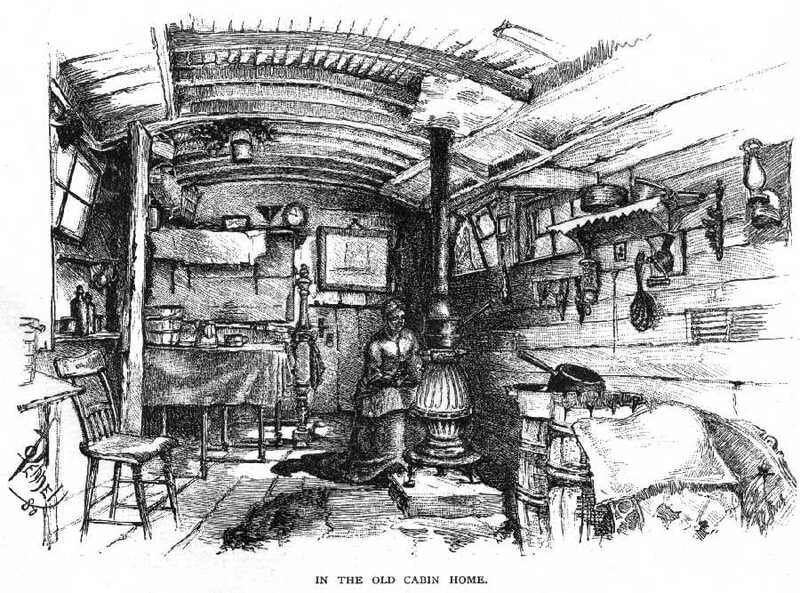 A substantial table covered with oil-cloth, and a bird-cage containing a green-tinted canary and two somber reed-birds, make up a homely interior. [PAGE 348] Passing farther on, you come to a smaller shanty, whitewashed excessively. A plump little pig, who has staid at home while all his brethren have gone to market, eyes contemplatively the front yard, which consists of a pool of stagnant water. 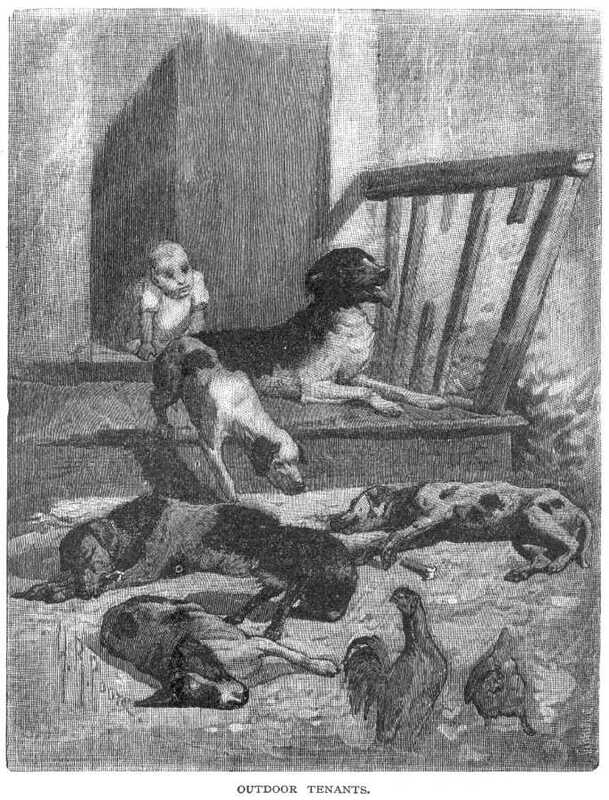 Two children are rolling over each other on the top step, and their mother, a comely Irish woman, sets down a plate of steaming potatoes, hastily hitches up her back hair with one hand, slaps a child with the other, sternly commands it "not to he botherin' the pig," and, in answer to our question, gives us directions about getting to the Point Breeze Gas Works. Southward lies "the loveliest village of the plain"--Martinsville. Martinsville has been confounded by careless geographers with another settlement--Eleven-Gun Battery; it is familiarly known as Frogtown. The structures that make up this village are in the best style of the architecture in vogue in the Ma'sh. Without superfluous ornament, it is composite and elaborate--in fact, if the word chaste may he used in connection with whitewash, it is chaste. Many of the Frogtown houses are made up of odds and ends picked up here, there, everywhere-- they are patchwork structures, some dark, weather-beaten, others immaculate. The houses lie in two rows. Bones, bits of broken glass, and roba of all kinds, strew the ground. The houses front on the main street. Stagnant water is everywhere visible; each house seems to have its own pond. Ducks, pigs, children, and the silent frog are happy in the abundant moisture. Dogs abound. They crowd the street; they sit on the steps, they have a look as if they enjoyed the right of suffrage in this village, and they receive you quietly and gravely, as becomes burghers who have the privilege of offering the freedom of the city to him who pleases them, The rear entrances to some of the habitations in Martinsville show that the citizens, like [PAGE 349] those of the metropolis, have more important things to look after than sanitary improvements. 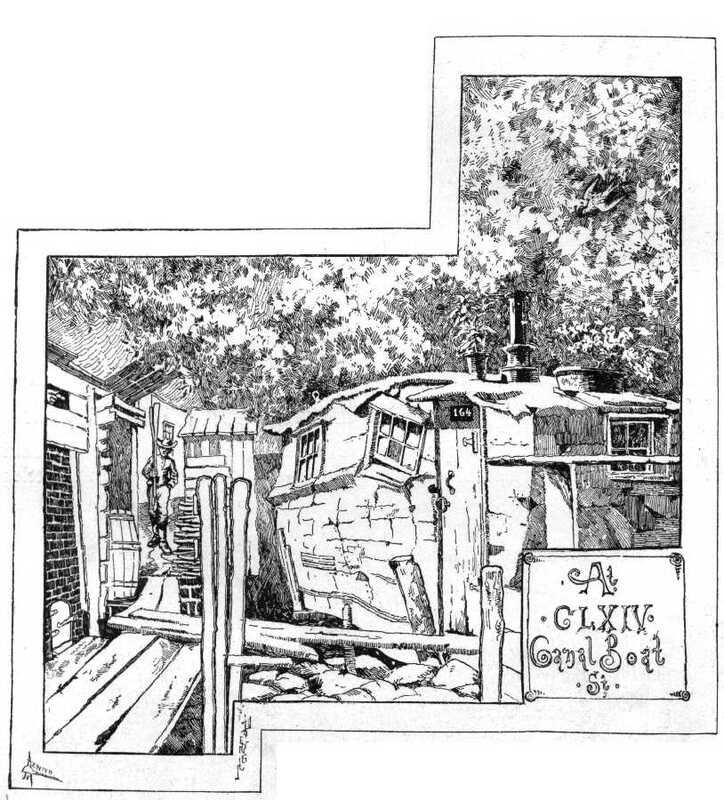 A specimen back yard shows oozy green mire dotted with oyster-shells, bottles, a broken ladder, old bits of timber, and parts of vehicles belonging to an older civilization; a rickety stable and a pig-pen are of the same style of architecture as the house. A strain of music strikes the ear. It comes from a dwelling that possesses an unusually large lawn of green, velvety ooze. You observe now that the disposition of the oyster-shells and broken bottles on this [PAGE 350] lawn betrays that the owner is more cultivated than the average citizen. A tomato-can placed exactly in the center, and evidently not cast there by a rude or careless hand, in a manner prepares you to believe that the pursuit of the fine-arts is not unknown within this humble cot. The owner, laboring to crush the notes of the "Danube Waltz" from an accordeon, comes forth. He is either Dutch or German--"Yarman," he says at last. 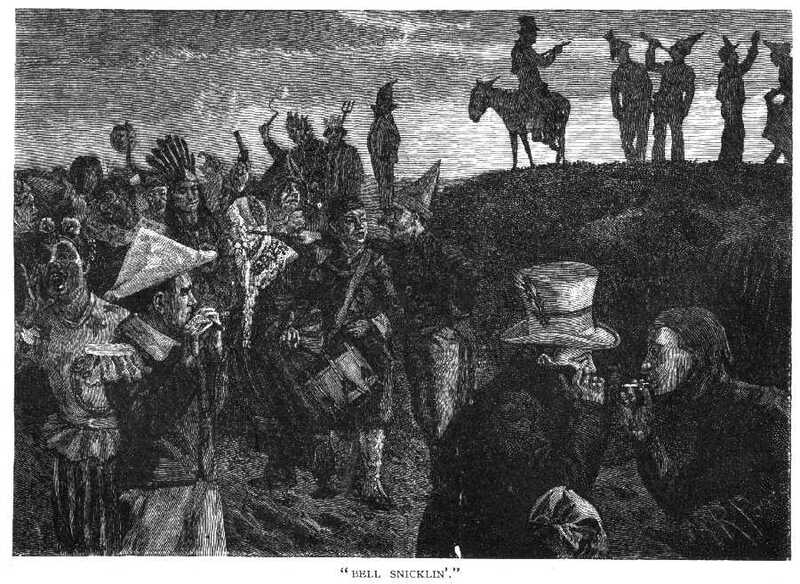 He explains that the accordeon is not what it was; he broke it last New-Year's night "out bell snicklin'." This custom is known in other parts of the Neck as "New-Year's shooting." On New-Year's Eve, crowds of men and boys dress themselves in fantastic costumes, and roam through the Neck and lower part of the city all night. This custom, doubtless a remnant of the old English Christmas "mumming," grows year by year in Philadelphia, and the mummers, becoming bolder, penetrate as far north as Chestnut street. This custom, attributed in New York to the Dutch, is not unknown in Brooklyn, where troops of fantasticals parade on Thanksgiving Day, Christmas, and New-Year's. Truck-farming in the Neck is not an unprofitable business. The market is near, and the objection which the fastidious make to the manure used in the Neck has not been found to be insuperable, and some inhabitants have managed, by industry and frugality, to acquire large and valuable truck-farms. Excess of moisture is the greatest enemy to the trucker. In the time of drought which ruins other farmers in less moist localities, he is happy; his esculents bring double prices. It is only in the time of floods that he is in grief. 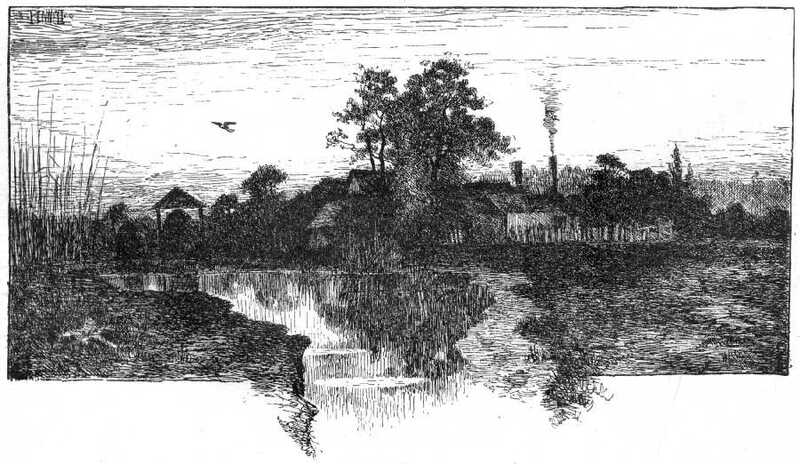 Along the river, the fields of bearded reeds wave to and fro; a puff of smoke floating above them at intervals, and the report of a gun, are signs that the sportsmen are out. In a corner of the swamp there is a picturesque cluster of novel houses--"Rudder Granges." It is a hamlet of canal-boats; beyond them lie the tiny boat-houses in which the city sportsmen keep their skiffs and sometimes spend most of the summer and autumn. The tide is low, and it is easy to examine this bizarre hamlet. A row of canal-boats rises from the swamp. The one nearest to us has, like most of the others, a second story added to the boat. A rude balcony is at either end; one of [PAGE 351] these swamp residences is distinguished by a clinging vine, and you almost expect to see Pomona come forth in a love-lorn reverie, with a weekly paper in her hand, to wait for high tide until she can step from the balcony into her lover's "scow." Old Sis's store is the most important feature of this hamlet. It is phenomenally neat. The sign informs the public that cider and cakes may be had within, but the exhibits show fossilized sour-balls, mint-stick twisted in an ancient pattern, and chunks of the horse-shaped gingerbread of the last generation, seemingly petrified. Jetsam and flotsam collected from the great river lie around in every direction--odds and ends brought in by the boats, which, more than once, have also brought in a corpse floating out from the crowded city, in which there seemed to be no room for it. Out of doors, boats are everywhere--and, like everything else in the Ma'sh, amphibious. The flat-bottomed skiff is predominant. A white sail flutters against the sky, and the [PAGE 352] steamer to Wilmington passes, sending a crowd of mimic breakers up among the reeds. 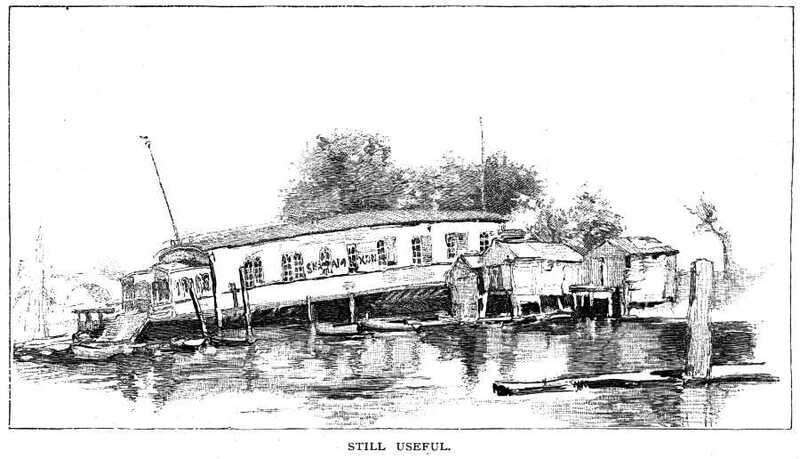 A canal-boat, lying against the bank, but still useful, covered with pitch, serves as a dwelling for several people. The proprietor, a pleasant-looking young Dutchman, who seems to have some connection with the work-sheds and dog-kennels on the bank, nods kindly. He is well satisfied with his house; it is weather-proof and he pays no rent. His wife and his grandmother live with him. To enter, it is necessary to stoop. The one room serves for all purposes. An old-fashioned "four-poster" bed, a stove, a quantity of cooking utensils in picturesque confusion, and a great chest, over which hangs a pair of horns, are the chief furniture of this interior. Nearer the river, around the row of boat-houses, lounge a few boatmen and fishers, getting ready rigging or oars, and patching boats for the coming campaign against the poetical bobolink, who, become a glutton, is fattening in the reeds. In summer no gunner haunts the Neck; in the spring and winter a few wild fowl and snipe are sometimes bagged. But in the fall--on the first of September--sportsmen, boatmen, and "pushers," who propel the flat-bottomed skiffs through the reeds, swarm into the Neck. Anybody who can beg, borrow, or steal a fowling-piece sallies forth, and many are the pepperings of shot that worthy citizens receive from their unskillful brethren in search of the coveted reed-bird, whose rich, juicy flavor resembles that of the ortolan, so famous in Europe. Toward sunset the reed-birds congregate in large flocks, and then the slaughter is great, and the noise is like that heard on any unusually jubilant Fourth of July. 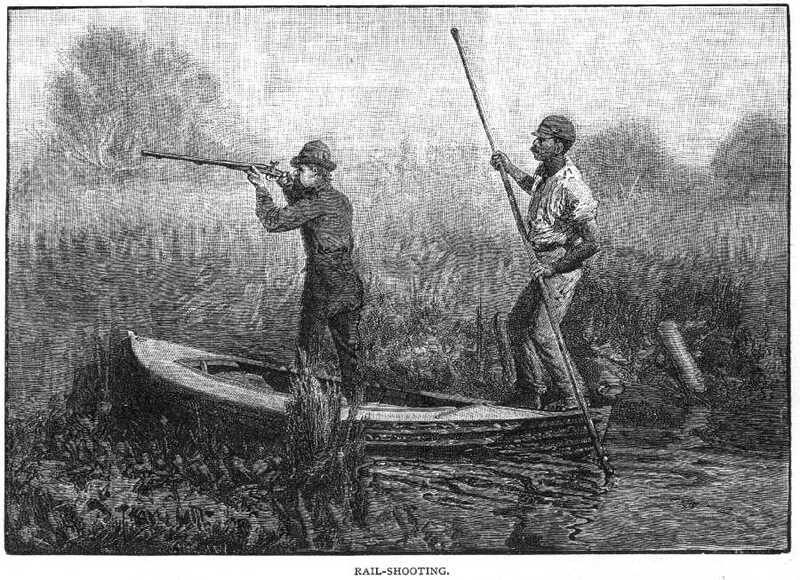 Rail-birds are also objects of pursuit in the Ma'sh; but rail-shooting can he enjoyed only at high tide, as the boat must be pushed over the reeds. Rail do not fly until danger is very near, and the pusher beats for the game with his pole until it rises. The rail-bird, when wounded, clings to the reeds, with his bill above water, and tries to breathe until he gets a chance to escape. A few plover are shot at times, but they are wild and scarce, and even the Ma'sher seldom boasts of having bagged many of this species.